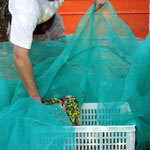 At Mas Auró, we harvest the olives when they befun to turn their color, in mid-November. 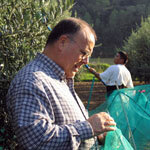 During the two weeks in which the harvest takes place, the olives continue maturing, until the last olives which are collected are already violet in color, a week away from the fully matured black olive. 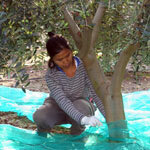 We only collect the olives in the trees. 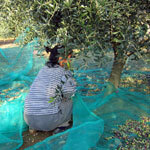 The olives which have fallen to the ground are left there for the birds and squirrels. 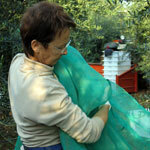 The olives are stored in open breathable boxes, to prevent fermenting, which are then taken to the olive mill, every 2 days. 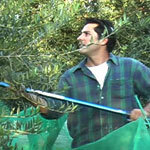 At the end of the harvest, we will have transported olives to the mill 7 to 10 times. 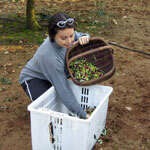 At the mill, we transfer the olives to a deposit, where they are cleaned, and branches and leaves removed. They are then weighed, and crushed, until they become a paste. transferred to another machine where the paste is "decanted", the liquids pass, the solids are discarded. The liquids move onto a centrifuge to separate oil from water. At the end of this process, a fluorescently green oil emanates from a spout and into a stainless steel container. It has been approximately 1 hour from the beginning to the end of the process. 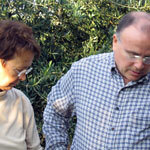 That fluorescent green oil, the freshest of fresh pressed olive oil, is overwhelming in intensity. It is always with great anticipation that we wait for these first drops. It has been a long season of caring for the trees. Harvesting has been laborious and tiring. This is the reward. 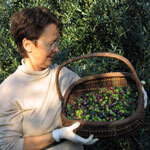 Every year we are surprised with the uniqueness of each harvest, as the flavors and aroma of the oil vary from year to year, depending on the climate. At Mas Auró, we store the oil in stainless steel vats. Oil is bottled on demand, insuring that the oil will be in the bottle as little time as possible before it is consumed.